Chamber cap: Tailored to suit application. 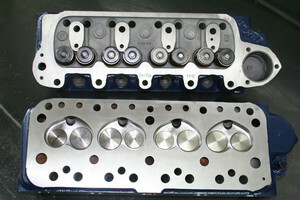 This specification of cylinder head is for the small-bore based engines with +0.060”/1.50mm and over bore sizes. The larger bore sizes allow the use of a larger exhaust valve without the need to pocket the block to balance the use of larger inlet valve size. Based on used core castings it is modified to CST current conventional road-sports style to maximise road-sports and track day/weekend-warrior performance when used with road-sports and super-sports camshaft specifications. That means optimised BHP and torque out-put through port shape and dimensions and valve throat shapes. Developed on an airflow bench and then on engine dyno/rolling roads to work with the aforementioned camshaft types along with suitable compression ratios given modern lead-free fuel specifications. Fitted with exhaust seat inserts for unleaded fuel compatibility. All cylinder heads are done to order as I have always more heads on order than I can ever hope to catch up with to produce stock for the shelf.